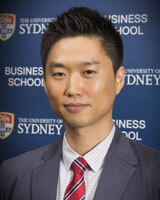 After completing his doctoral degree from the University of Illinois at Urbana-Champaign (Ph.D in Marketing), Kiju Jung joined the University of Sydney Business School in August 2014. He received a prestigious ACR-Sheth Foundation Dissertation Award in 2013 (public-purpose track), and his research appears in major marketing journals such as Journal of Consumer Research, Journal of Public Policy & Marketing, and Journal of Macromarketing. His research interests surrounds two specific streams such as (1) consumer behaviours and well-being in the non-WEIRD (Western, Educated, Industrialised, Rich, and Democratic) marketplaces, and (2) the interface of political ideology and marketplace behaviours. He is teaching an innovative postgraduate unit “Customer Analytics & Relationship Management” that focuses on helping students to be equiped with data literacy through the state-of-art customer analytics such as data mining, predictive analytics, and data visualisation. His broad interests in consumer behaviours are manifested in two specific research streams. The first research stream aims to explore consumer well-being and behaviours in the non-WEIRD (Western, Educated, Industrialised, Rich, and Democratic) marketplaces, while considering both psychological (e.g., thinking styles, fate beliefs) and ecological factors (e.g., poverty, education, social capital). Understanding consumer behaviours and well-being in the non-WEIRD context is important as our current understanding has often been limited to the WEIRD setting that accounts for less than 20% of the entire population in the world. His research in this area has appeared twice in the Journal of Public Policy & Marketing. The second research stream examines how political ideology influences a variety of marketplace behaviours. Given increasing polarisation in social life, it is important to understand the intertwined nature of political ideology and marketplace behaviours. He combines theoretical lens from political psychology with advanced analytical approaches using a large-scale data, and he has two articles published in the Journal of Consumer Research, drawing considerable attention from international media outlet, including LA Times, Boston Globe, and Pacific Standard. Jung K, Shavitt S, and Viswanathan M (2014) Are Hurricanes with Feminine Names Deadlier Than Hurricanes With Masculine Names? Society for Consumer Psychology Annual Winter Conference 2014; Society for Consumer Psychology (SCP), United States. Jung K, Wyer, Jr. R, and Viswanathan M (2013) Power, Gender and Consumption Choices: The Gender-Matching Effect 2013 Society for Consumer Psychology Annual Winter Conference (SCP 2013); Society for Consumer Psychology (SCP), San Antonio. Viswanathan M, Sridhraran S, Ritchie R, Venugopal S, and Jung K (2012) Marketing Interactions in Subsistence Marketplaces: A Bottom-Up Approach to Designing Public Policy Journal of Public Policy and Marketing, 31 (2), 159-177. B&T reported on new research from Dr Kiju Jung and Professor Donnel Briley from the University of Sydney Business School that found being polite when making complaints is more likely to bring about results than being angry. Australian Financial Review reported on new research from Dr Kiju Jung and Professor Donnel Briley from the University of Sydney Business School that found being polite when making complaints is more likely to bring about results than being angry. Valley News (USA) quoted Kiju Jung on a paper he co-authoured about the habits of conservative consumers, in relation to Obamacare. Los Angeles Times (US) reported on research co-authored by Kiju Jung which found conservative voters are more inclined to believe in society’s institutions. Los Angeles Times (US) reported on research co-authored by Kiju Jung from the Business School which found conservative voters are more inclined to believe in society’s institutions.